is a dramatist, actor, puppeteer, juggler, clown, mask-maker & Tri-Met bus operator. is a recent graduate of Oregon State University where she received a bachelor’s degree in apparel design. Although she has designed costumes and apparel for various festivals and has shown her work on the runway both at her University and at conventions, this is her theatrical debut in costuming. She enjoys attending local theater productions and spends her free time learning new ways to upcycle apparel. , a lifelong dancer, and Evan Wallace, a physicist, have been dancing, teaching, and performing Tango in Seattle since 1996, and travel frequently to Argentina and other Tango communities throughout the world in pursuit of their shared obsession. They have been featured in numerous tango shows including Tango Nights, Tango Dreams, and Tangoing, and have produced various shows as well. had a successful debut in 1986 as the General in Peter Ustinov's The Unknown Soldier and His Wife. He is a member of the Ladybug Theatre where he played the King in Sleeping Beauty this summer. is thrilled to return to Milagro, having played in La carpa del maestro. She was last seen in Agatha Christie’s Spider’s Web (Lakewood). Credits include Pride & Prejudice (Quintessence), All My Sons, A Streetcar Named Desire, Orson’s Shadow (ART), Tales of Ordinary Madness (CoHo), One Flew Over The Cuckoo’s Nest (Brundog/Integrity), A Midsummer Night’s Dream (Lakewood) and Valparaiso (Vertigo). Films include American Disciples and Everyman’s War & the sitcom pilot Nick Bradley Might Be An Alcoholic. has been adding his breaking techniques from his experience as a Trailbreaker dancer, Def Con 5 & MOVEO company member. a native from Puebla, Mexico, began his professional career as a Mexican folkloric dancer at the age of eight, participating in companies as Zazhil and Citlatepetl. He studied at The Dance School of Concepcion Quiroz in Veracruz where he received training as folkloric dance teacher and choreographer. Since his arrival to Portland in 2000, has been an active member of Ballet Folklórico Atzinameyalli (trans.Spring Water) and has performed in various festivals such as the Pablo Neruda’s Festival, Cinco de Mayo and theatre productions in Tears of Joy and the Miracle Theatre Group. This is Fabian’s fifth show at Miracle after Posada Milagro, Day of the Dead Festival and El Jardín de Sueños. is the Assistant Education Director for Oregon Children's Theatre. Her favorite acting roles include Elma Duckworth in Bus Stop, Helen Potts in Picnic and Mrs. Barker in American Dream. Besides performing, she has worked as a makeup designer, stage manager, set/costume construction and project assistant for The Misanthrope at ART. has recently settled in Portland from her home in New York, New York. She worked professionally as an actress in many of New York's Off-Broadway and surrounding regional theatres. She's assisted directors including Austin Pendleton, Julianne Boyd, and Richard E. T. White. In the Portland area she has worked as a guest director for Linfield College, directed for Storefront's New Playwright's Festival. For the Miracle Theatre, Jane directed Roosters and last fall's production of Electra. Most recently she directed Sharon Whitney's Five Minute Wars for Firehouse Theatre's Experimental Projects. is thrilled to be in Portland to make his Miracle Theatre Group debut. Marco is a Pueblo de la Reina de Los Angeles native. He has had the fortune of working on television and films like Tengo Miedo. Marco’s theatre credits include: As You Like It, Take Me Out and Novio Boy. Marco is honored to be working with such an incredibly talented cast and crew and would like to thank his family, friends and his community back home and here for their wonderful encouragement, care and continued support as he ventures forth into the unknown. grew up in Eugene with an artistic mother and musical father. He got into art in high school where he got to paint his first spray can mural and now owns his own art and clothing business called Fresh Paint. Levi is a board member of the Oregon Chapter of the Universal Zulu Nation, for which he helps organize community events, teaches after school programs, paints murals to clean up neighborhoods and performs as a part of the Hip Hop group. He also performs with his break dance crew Raw Action, is a certified yoga instructor, and teaches both dance and yoga at Portland Community College. is performing in her first production with Milagro. She has performed in Romeo and Juliet, You Can’t Take It with You, and Big Love (Portland Actors Conservatory) and For the Time Being (Claire Willett). She has been the Narrator for readings at Profile Theatre – Buena Vista (Desdemona Chiang) and Hungry (Adriana Baer). Arlena has been an Assistant Director to Philip Cuomo for Dog Sees God (Portland Actors Conservatory). She has also directed La Bonne Fille - a video/multimedia short and Normal - a short film at the Gulf Island Film and Television School. Arlena is a graduate of the Portland Community College Multimedia Program and the Portland Actors Conservatory. She is a participant in the Yale University Directing 1 Summer Intensive. Arlena also has a J.D. from Harvard Law School and a M.P.P. from Harvard Kennedy School. teaches English at Portland Community College. He has published poems, essays, reviews, articles, and translations. He is the originator of Wood Works, a dramatic adaptation of C. E. S. Wood's Heavenly Discourse. Tim has lived in Latin America and studied Hispanic poets. His roles have varied from the young Winthrop in THE MUSIC MAN to his latest role as Ramon in the tragic musical THE ME NOBODY KNOWS. He attends Grant High School where he is enrolled in Drama along with a Men's Ensemble choir class. is a resident artist/scholar at Miracle Theatre and a Rockefeller Postdoctoral Fellow in Caribbean studies. His work has taken him to Costa Rica, Mexico, Dominican Republic, Jamaica, and Puerto Rico. He most recently performed in Milagro's production of En Este Valle de Lagrimas and Vision de Jaguar, and is a principal dancer/drummer with Milagro Bailadores. is pleased to be returning to Miracle Theatre where he last directed Milagro on Calle 401K. He received his BA in Theater from the University of Wisconsin at Eau Claire with an emphasis on Directing. From there he served as co-artistic director for The Bare Bones Theater Company. Mark has also directed a production of The Dumb Waiter in Winchester, England; Carousel and Trial By Jury in Hancock, New York; and also produced, directed, and wrote a public access television show entitled, “B.B.T.C. News,” for which he received a, “Most Promising New Producer” award. Since arriving in Portland he has been working his way back into directing by serving as Technical Director for Triangle Productions, Musical Theater Company, SITE, and Guest Technical Director for Artist Repertory Theater. Christopher Beatty is a composer, sound designer, and actor with a penchant for the absurd. Recent projects include Northwest Classical Theatre Collaborative’s Three Sisters, Fuse Theatre Ensemble’s Tether: A one woman anti-circus, Jewish Theatre Collaborative’s Davita’s Harp and The Ministry of Special Cases, and the Spectravagasm series. You can hear his work every holiday season underscoring the hugely popular Christmas Carol: A One Man Ghost Story with the inestimable Phillip Berns in various locations across Portland. He is currently a company member with The Reformers, and performs music with the band Brothers Hallowed Junction. Kushi was thrilled to be making her Milagro debut in Éxodo! She most recently performed in Savage Love (Imago) and has worked onstage and backstage with Portland Experimental Theatre Ensemble (PETE) doing research on the devising process and performing in The Three Sisters. She received her training from Lewis & Clark College where she wrote, produced and starred in her original thesis performance, Tidal. Kushi is a proud member of the local a cappella group, B-Side Book Club, and the facilitator of a new work collective, The Portland Artists Salon. graduated from Reed in December, 1994, with a B.A. in Theatre and is therefor actively pursuing a career as a mostly-employed artist. She has worked at Northwest Children's Theatre as a class assistant since January. Before that, she spent all of her time directing, acting, doing stage management and design for Dreadnought Theater Company. In her abundant free time, Cassy writes art reviews for TONIC magazine. lived in Washington DC for six years, where she attended the Model Secondary School for the Deaf. At the MSSD she studied mime, dance and abstract theatre. She is a 23 year old vegetarian who writes poetry and has a great appreciation for nature. last worked for Miracle as costume designer for Barrio Hollywood and is pleased to be walking its stage as an actor this time. Virginia appeared recently in Exit the King with Arts Equity and Broadway Bound at Lakewood. She’s performed with Stark Raving, Artists Rep, Tygres Heart, Portland Actors Ensemble and Oregon Children’s Theatre, among others. Virginia has danced professionally with American Festival Ballet, Duluth Ballet, and Indianapolis Ballet Theater. She teaches ballet, modern dance and acting for Willamette University. has lived in Portland for 8 years. She has studied at the Training Ground for the past 2 years and has performed in the one act play The Insanity of Mary Girard. Cuentos! is her second stage performance. just completed work at IFCC for Answers. Versed in many areas of technical work, this is a debut for Ross with MTC. es actor, titiritero y baterista. Estudió drama y literatura en la Universidad Autónoma De México. Ha trabajado como actor y músico en más de 18 obras entre las que constan La lucha con el ángel, Sueño de una noche de verano. La repugnante historia de clotario demoniax, Troka el poderoso, y El tablero de las pasiones de juguete. Como titiritero ha trabajado en teatro, televisión (Plaza Sésamo) y televisión por Internet. Ha trabajado como productor y locutor en radio Internet. Trabajó con El Grupo de Teatro Bochinche (1992-1999) y con El Grupo de Teatro Tinglado (1995-2005). En este momento está trabajando en un nuevo proyecto de teatro de juguete, Panteón de Fiesta, con su propia compañía Facto Teatro. Este proyecto es una producción del Music Center of The Performing Arts Center of Los Angeles County, con el apoyo del Jim Henson Foundation que se estrenó durante el International Festival of Toy Theater en junio. has been seen in Shakespeare-in-the-Parks since 1982 in which she has played Audrey and Rosalind in As You Like It, and the princess in Loves Labours Lost. She is a regular performer in children's theatre at the Ladybug Theatre at the Washington Park Zoo. has toured as a singer/dancer for USO shows to Vietnam, Korea, Alaska and through the Mediterranean. Ms. Benson also toured with the New Oregon Singers all over the world and performed with bob Hope, Sammy Davis, Jr., Phyllis Diller, Burl Ives and Lawrence Welk among others. She assisted Donald McKayle with the choreography for the Alvin Ailey Dance Co. in New York City, but always returns to her Portland home where she is the resident choreographer of the "Leyden Singers and Dancers" for the Oregon and Seattle Symphony "Pops" series. Most recently she was seen as the Rooster Dancer, Zapata, in the Hispanic Cultural Festival production of Roosters. is new to Portland Theatre and this is her first production with the Miracle Theatre Company. She has been seen in everything from Moliere's The Misanthrope to original plays like Maureen and The Aliens. Sue is a native New Yorker. She has performed in New York, Atlanta, Washington, DC, St. Louis and Breckenridge, Colorado. is originally from the San Juan Islands in Washington, Ayanna was just three years old when she began performing on stage for audiences. As she has grown, she has become an accomplished actress, singer and dancer for film, television and theatre. But it was her love of the European theatre and French film that led her to move to Paris when she was only 18. Berkshire immersed herself in the French language and found employment as a stylist in the Paris fashion industry. After spending a few inspiring years in France she returned to America and began pursuing her acting career. Some of Ayanna’s favorite roles on stage have been, Sophie in Pure Gold Baby, John and Don Russell-The Fox in The Tales of Canterbury and Kenric in Bang. Curtain, End of Show!. You can also see Ayanna currently in these films: 2004’s “The Dust Factory,” “The Good Lot,” and 2005’s “ The Heater,” “Say Uncle” and “ Reality Check.” Ayanna is pleased to be a member of Fuente Ovejuna. This show marks the first, of what she hopes will be many, with Miracle Theatre. Ayanna would like to thank the cast and crew of Fuente Ovejuna for their hard work and great humor and her family and friends for their endless support and encouragement. graduated from Portland state University in 1996 with a degree in Anthropology. In addition to performing with Milagro Bailadores he also dances with Keith Goodman and play music with Virginia Lopez and the Mambo Queens. Jesse has also studied music and dance abroad in Jamaica and Trinidad. Michael's recent Portland appearances include roles in The Night of the Iguana (ART), and in The Birthday Party, The Homecoming and The Price (Profile Theatre Project). In years past, he was a professional actor in New York City, appearing on Broadway, off-Broadway, and in a variety of television commercials. He also earned a Ph.D., and as a college professor he headed a vigorous acting program at Illinois State University. For 15 years, he was Director of Education and Community Service for Portland Opera. He currently teaches opera-related subjects in a variety of contexts at Portland State University. has had a theatre career spanning 40 years. Her favorite roles include the Betrothed in Lorca's Bodas de Sangre, Lady Capulet in Romeo and Juliet, Ismene in Antigone, and Gertrude in Hamlet. She played Norma in Plaza Suite and Mrs. Higgins in My Fair Lady, as well as singing in Gilbert and Sullivan operettas and musical comedies. es la dramaturga más aclamada y con más éxito comercial proveniente de México. 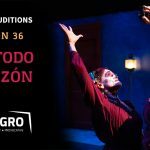 Ha ganado el Premio Nacional de Teatro de México cuatro veces, un hecho sin precedente. Berman ha escrito libretos para películas, poesía, prosa y periodismo sumado a su trabajo para los escenarios. Su colección de entrevistas con mujeres Mexicanas en posiciones de poder, Mujeres y poder, ganó el Premio Nacional de Periodismo en el año 2000. Recientemente escribió el libreto para la nueva película del director Jorge Fons, acerca de los asesinatos en la frontera de Juárez, y escribió la adaptación de “La Historia de Amor” para el director Alfonzo Cuarón. Sabina Berman is Mexico's most commercially successful and critically acclaimed playwright. She has won the Mexican National Theatre Prize an unprecedented four times and has written film scripts, poetry, prose and journalism in addition to her work for the stage. Her collection of interviews with Mexican women in positions of power, Mujeres y poder, won the 2000 National Journalism Award. She recently wrote director Jorge Fons' new movie about the murders on the border of Juarez, and the adaptation of "The History of Love" for director Alfonso Cuarón. is an African-Mexican American and recent transplant from Seattle. He came here to perform in ART's Raisin in the Sun for which he won a Drammy for Actor in a Supporting Role. Other favorite experiences include Torch in Beirut, Royal Boy in Police Boys, the Husband in Killers, Purlie in Purlie Victorious. Bermea has also produced two of his own plays-Saint Heroin and Mercy. He will next be performing in The Nightmare in My Closet with Tears of Joy and The Trial with Cygnet Productions. is a first timer with Teatro Milagro, but definitely not a first timer with theater in general. She has been doing lighting design and tech throughout Washington state for many years and has recently joined up with Lunacy Stageworks here in Portland. She would like to thank her partner, Greg, for coming along in this adventure with her. works for Streetlight Youth Shelter, a homeless youth shelter. This is her first time working in theatre. goes to Jackson Middle School, 8th grade. She enjoys anything to do with the arts. She also enjoys sports and living life to the fullest. She would like to say hi to all her friends and family and anybody else that would like to include themselves. She would like to thank you to everyone. Marisa Bevington was born in Buenos Aires, Argentina and came to Portland as a teenager. She has lived and traveled throughout South America. Currently she is a Spanish teacher at Lincoln High School. Marisa's acting experience has always been connected with Latin America: Mrs. Pinochet in Vaudeville at Storefront, Maria in a play benefit for a free Chile, and Mothers of Heroes, a play about Nicaragua at Stark Raving. makes his third appearance with the Miracle Theatre, previously performing the roles of Theseus in Theseus, A Dangerous Journey and Nelson Cruz in Our Lady of the Tortilla. He is a graduate of Lewis and Clark College receiving a BA in Theatre Arts. At Lewis & Clark he performed in The Bacchae and The Sure Thing. is thrilled to be departing from his usual agenda of playing violently maladjusted characters with substance abuse problems. He has appeared in several plays, including this one. Sierra Brambila is a current actor & teaching artist for Teatro Milagro. You may have seen her in Milagro's production of Bi- (Isa) or perhaps her last show The Mermaid's Project (Allana). This is her first time assistant directing and she is so grateful to learn alongside a director she truly admires and help bring this story to life. Her biracial background inspires her to give voice to stories of representation, truth, and diversity. Lastly, she thanks her mentor Liz Vice for always pushing her to ‘go deeper with her passions’. Jessica Bobillot is an apparel artist who has worked on dozens of theatrical production, favorite credits include: Sense & Sensibility, (PAC), One Flea Spare (Shaking the Tree), Road to Mecca (Profile Theatre), Seven Guitars (ART), As You Like It (Portland Shakespeare Project), The Pride (Defunkt), and Three Sisters (Northwest Classical Theatre Collaborative). She also designs for dance, film, and special events. Her dresses have been seen in Martha Stewart Weddings and have won awards at The Red Dress Benefit Gala. She holds B.S.A.s in painting and printmaking as well as in apparel design. Jean-Luc is a French actor based in Portland. He was seen in Love’s Labour’s Lost (Post5 Theater), The Other Place (Portland Play House), Time, a Fair Hustler (Hand2Mouth), Remme’s Run (COHO production), and Twelve Angry Jurors (Voice for the Voiceless). Jean-Luc works also for cinema, television and radio. In Portland he has appeared in Z Nation, The Librarians, Portlandia, Grimm and Leverage. Jean-Luc was thrilled to be part of Exodo and excited to be working with Milagro. Lindsey Bruno is thrilled to be working with Milagro for a second time. She recently participated in the Ingenio reading series as a director, and fell in love with the company. Originally from Los Angeles, Lindsey has worked as a producer and production manager across a number of entertainment fields. A director and performer at heart, Lindsey is so grateful for the chance to direct again after having trained with the Director's Lab West. You can see her in Stumptown Stage's upcoming of Jesus Christ Superstar at the Brunish Theatre this spring. is a visual and performing artist from Medellín, Colombia, where she trained as an actress in local academies and performed in theater productions before focusing her artistic energy into visual art. Buri moved to Portland in 2009, and in 2013 was invited by Olga Sanchez to participate in Milagro’s staged reading of Mummified Deer, which reconnected her with her love for performing. Since, she has acted in educational videos and in other Milagro projects including the Milagro/Metro touring production El Tesoro/The Treasure. Locally, she has trained with Nelda Reyes (Grupo Condor) and Kristina Haddad (The Actors Lab). Buri is thrilled to be back at Milagro and thankful to director Georgina Escobar for the opportunity to work and learn so much from her, and next to such talented actors and crew. Special thanks to Justin and Iza, siempre conmigo. See her visual art on Instagram @mayacraftroomart.